If you have to work while you’re on vacation do not worry about missing out. Plenty of people have to do a bit of work while they’re away and they manage to get it all done and still enjoy their time away. So, whether you’re heading for some of the luxury vacations in italy that go down a treat, or you’re simply travelling with the family for a quiet time away, you may appreciate some tips. Ideally, you would have already found out where the best WiFi is before you booked your accommodation so you can work in a town or city that does not struggle to get a connection. However, if you have already booked a place to stay do not worry, chances are you’ll find somewhere nearby with a good connection. Please be aware that you may have to pay extra for using WiFi every day. If you think you’re going to use up the limit that the hotel or villa have set you, why not see if they can give you a good price for all of that data you’re going to use? Internet cafés are really good at acting like mini offices for a few hours, or for the whole day. Of course, you will have to pay for your time spent in the café, but the prices are usually quite good and you’re almost guaranteed to have as much WiFi as you need. You’d be surprised as to how many people work out of internet cafés. These establishments don’t just cater to gamers and those who love to spend time in chat rooms, some people frequently use them as their office. 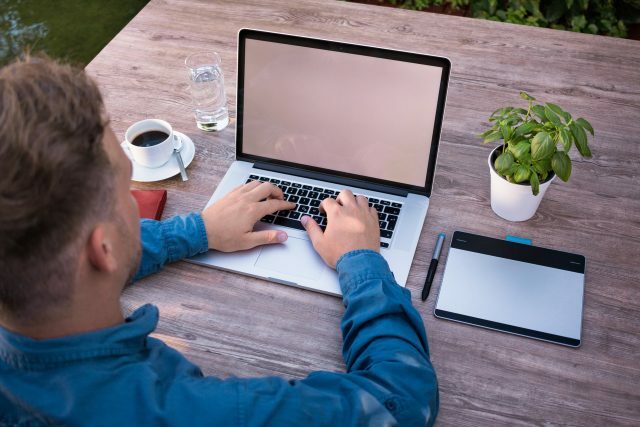 Wherever you end up working, whether it’s in an internet café, the corner of your hotel room, or on your villa’s decking, you need to find a dedicated place to work. What this means is that your work space should be your work space and not an area for the kids to play around. Some cafés offer free WiFi and are happy to keep offering you it if you buy a drink every now and then. Why not see if there’s a café somewhere near you that lets you sit and work in relative peace? You need to act like you’re at work when you’re working, and you need to tell people not to disturb you. If you need to be focused and you need to concentrate you will need to be left alone to get the job done. This is where finding a dedicated work space can come in handy. Set your computer or tablet up, get a WiFi connection, and get to work. So you’re on vacation and you’re desperate to see as much of Italy as you can, but first thing’s first: you need to get your work done. A good way to make sure you get all of your day’s work done is to start work before you do anything else. This means you may have to join everyone else at the beach in 4 hours, or you may have to stay in the villa all day but this is what you have to do. Try not to be tempted to ditch work so you can go off and enjoy yourself. Too many people assume that they will make enough time to get all their work done, but the reality can be quite different. I know there are lots of fabulous things to do, and the to-die-for beaches are calling your name, but you can always do those things when you’ve finished working for the day. Depending on how much work you have to do, you should try to set aside at least 2 hours every day. Get at least a few hours worth of work done and as long as you concentrate you won’t have a huge pile of work to come back to the next morning. Here’s something you may want to consider doing: Get up earlier than everyone else so you can get your work done before you join them for breakfast. If you only have a few hours worth of work to do then it could be worth your while setting an alarm so you start work early in the morning. Remember There is Work to do! I know that the sun may be shining, that there’s some delicious gelato to be had, and some tourist spots to see, but there is work to be done. If you have so much work to do that you simply cannot drop everything and bathe in the sun, you’re going to have to stay motivated. If you manage to get a lot of work done you may want to think about treating yourself. Rewarding yourself for a job well done can make you feel good, and motivate you to carry on working even when you really don’t want to. If you can, try to get all of your work done as soon as you can so you have more time to enjoy your vacation. If you simply cannot get all of your work done in one go spread it out over the week so you only have to do a little every day. It is entirely possible for you to work during your vacation to Italy, and still get to see all the sights. Concentrate, try to stay motivated and you’ll get all your work done before you know it.